Regina is an Italian maker of freewheels and chains. Regina freewheels are generally used in road racing applications. The current version of Regina freewheels are known as America or Synchro "1992". Although the year coincides with the bicycle model season that they introduced, they were really given the "1992" moniker because, in 1992, in Europe, (where they're based), the European Common Market merged into one European Community eliminating Tariffs and duties between all their borders. They call it "1992" or "'92" in acknowledgment of the EC's founding year. There are no scheduled product changes in the Regina line through at least 1995, though the freewheels will still be referred to as "1992". Regina previously has made freewheels with years in their title before, the last version was known as '"90". Regina also makes a Synchro 92 freewheel. The Synchro series was originally designed for use specifically with the Campagnolo index system. The 1992 model has been redesigned to be less specific and will accommodate all other major indexing systems. We don't sell the Synchro freewheel because it replicates many of the America model features, while having as a drawback the fact that the body is un-plated black steel (like Regina's earlier models), and the cogs are zinc plated, rather than Chrome finished. America 92 freewheels are available in both 7 and 8 speed versions. The way you can tell Regina America freewheels made previous to the 1992 model is the color of the freewheel body. Older America freewheel bodies, (90 and before), are Black in color, while the 1992 series is Silver in color, because both the inner and outer body parts are Chromium treated, which increases their wear life, and diminishes the effects of rust, and oxidation. The 92 series also has only the first position on the 7 speed and the first and second position on the 8 speed thread onto the freewheel body, all the other cogs slide onto the body and are held in place by these threaded cogs. The cogs are made from 1.8mm thick steel, with V-notched tops on all but the threaded cogs, which have flat tops, and a machine beveled front face. The cogs on the America 92 freewheel are given a Chrome finish, giving the cog a longer life, older models had just a zinc plating. The cogs have 3.0mm spacers between them, so this freewheel is compatible, with all present indexing systems, including Aris, Mavic, Suntour Accushift Plus, and Shimano SIS-HyperGlide. The America freewheel uses one steel and three plastic spacers, with the set weighing 22 grams. 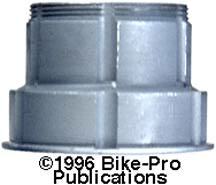 The outer cone race is made of machined steel, with remarkable workmanship. It is removed by turning it clockwise. The top surface of the outer cone race is milled and drilled with two holes for it's removal. The inner threads are very smoothly cut, and the bearing surface is as smooth as we've seen. There are thirty-two 3.0mm steel ball bearings used in the outer bearing assembly. Regina has upgraded the balls in the '92 America F/W body, making them smoother and delivering a quieter mechanism than their previous models. The inner cone race, (on the inner body piece), is similarly well polished. The cup races in the outer body are also well ground and polished to mate with the finish on the cone races. The inner bearing assembly has forty of the same 3.0mm steel ball bearings used in the outer set. Both the inner and outer body pieces are forged of steel as a single piece, with highly precise work to deliver, very tight tolerances among all the parts. The Regina America 92 F/W uses two steel pawls, which are held in place and operated by a circular wire spring that is a little stronger/firmer than those used in other freewheels. The America has no external lubrication ports, re-lubrication is performed with a light oil introduced through the front face of the outer cone race. The America freewheel comes with a tight fitting snap-in plastic dust cap that shrouds the outer cone race and prevents exterior contamination of the bearing cavity. The Park FR-5 freewheel removal tool is recommended for removing the America 92. 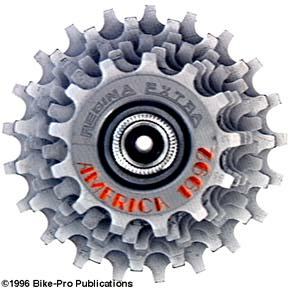 We sold the America 1992 7 speed for $45.99 and it was made in 6 sprocket combinations, 12/18 - Cogset Type B7, 12/19 - Cogset Type C7, 12/23 - Cogset Type F7, 13/19 - Cogset Type P7, 13/21 - Cogset Type R7, or 13/23 - Cogset Type S7. Regina makes an upgraded version of their America 92 freewheel, called the America 92 Superleggera, or "America 92 SL", as it's more commonly known. It has hardened aluminum cogs, rather than the steel ones on the America. The aluminum cogs are machined from plate stock, milled, drilled and threaded where required. The reduced weight, aluminum cogs are the only difference between the two. The SL is built using the America 92 F/W body. Details of the inner workings are available above. We thought this was a great product that never really suceeded, because there was a mis-understanding in that patent Shimano held on their cogset. 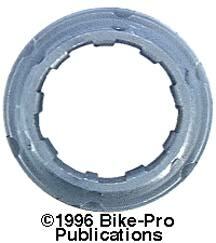 Shimano was able to protect only how the freehub body fastended to the hub not the shape of the cog inner notch pattern. Regina also makes an aluminum cogset that replaces the steel HyperGlide ones used frequently on Shimano hubsets. This is really a clever use of the freewheel cogs that Regina makes for the America 92 SL. Regina machines of aluminum, a cogset "carrier" that slides onto the Shimano hub, the exterior of this carrier is made like the exterior of the America freewheel body, which permits the aluminum SL cogs and spacers to be built on the outside of the carrier. 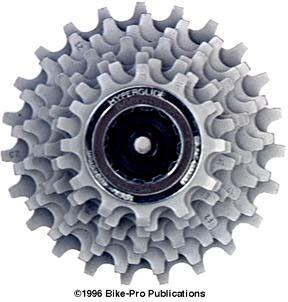 Remember, in our discussion of Shimano cassette sprockets, that we said all of Shimano's previous UniGlide sprockets fit on the HyperGlide body? We also mentioned that UniGlide used small square notches all the same size, and that HyperGlide cassette sprockets had one slightly wider notch, yet the UniGlide notch fit comfortably within it. Regina elected to use the UniGlide notch pattern, so that it can fit on any cassette hub that Shimano has made since at least 1981. The carrier weighs 56 grams, is as beautifully constructed, and machined as all other Regina parts are. The carrier comes in two sizes, one for 7, the other for 8 cogs. Regina overcame the problem of Shimano's older style outer threaded freehub body and their newer style internal threaded lockring which holds the cassette on to the freehub body. If the end of your freehub body has threads only on the outside of the of the freehub body end then you will need what Regina calls a "B8" 1st position cog. If your freehub has threads on the interior of the end, (HyperGlide type), then you will need the "B9" first position cog.